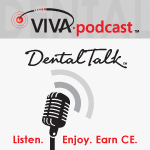 Dental podcast hosted by Dr. Phil Klein: Lithium disilicate is a glass ceramic with proven clinical success, and is known for its excellent combination of strength and aesthetics. But restorations made with traditional lithium disilicate materials have some drawbacks. In today's Viva Podcast, we'll be talking about a new high-strength lithium disilicate (GC LiSi Press) that offers dramatic improvements over traditional lithium disilicate ceramic materials. An expert on the topic, Dr. Miles Cone, a prosthodonist from Portland Maine, will be giving us some insight into this new material.